On the bottom of the pal list area you will see a 'rooms' icon. 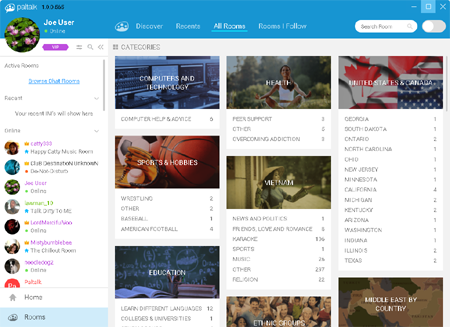 Click on the 'rooms' icon to bring up the category view. The chat room category view looks like the picture below. You can scroll up and down to see the list of categories. 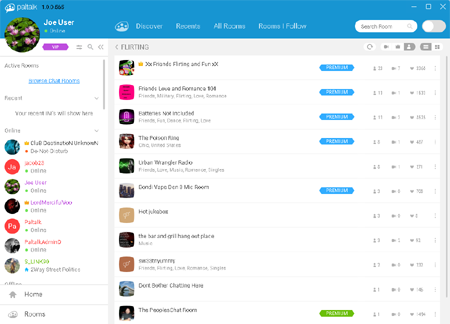 Chat rooms are categorized by interest and geographical location to make it easy to find rooms you will like. For now be sure that 'all rooms' is selected in the header of the room browser. This will make sure that all rooms that are currently open will be listed. 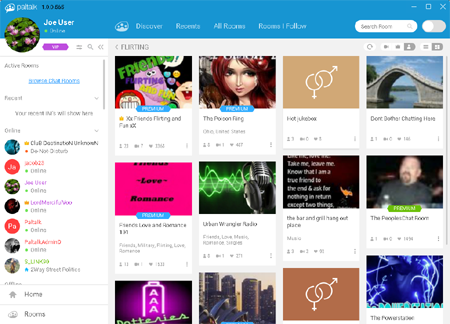 The main categories contain sub-categories. Click on a sub-category to get a list of chat rooms in that sub-category. 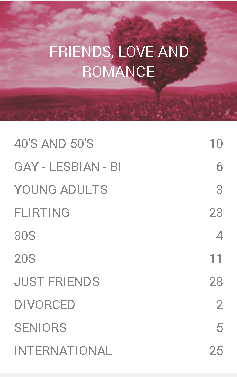 For example, under the 'Friends, Love and Romance category you see a list like the one below..
You can use the standard 'tile view' or you can switch to 'list view' using the gray toolbar icons on the top right. Click the 'list' or 'tile' icons on the extreme right to change views. You can also refresh the list, or sort by number of view-able web cams in rooms, crown level, or number of participants in the room. Premium rooms are sorted to the top of the list in the 'Promoted' area. Premium rooms show the Premium Badge.